A while back a friend of mine told me about a modified Dash 8 that the Army was using that had been flying out of his airport. It ended up coming to Livermore – a short drive from home. I went to see it but it was parked in a hangar on the other side of the field and I couldn’t see much. It flew a few times but never when I could see it. I figured that there was nothing much to do since I wouldn’t see it. Imagine my surprise when I came across its siblings. I was driving around Tucson International when I saw two Dash 8s parked up. Sure enough, they were in the same configuration as the previous one. This time they had their civilian markings obscured. A little check with Google and they are apparently RO-6A airframes. The Air Force operates Dash 8s to monitor ranges for traffic under the -7 designation but these are different. Spooky stuff no doubt. Sadly, they didn’t move while I was there but they had been active. I was just glad to catch them out in the wild. 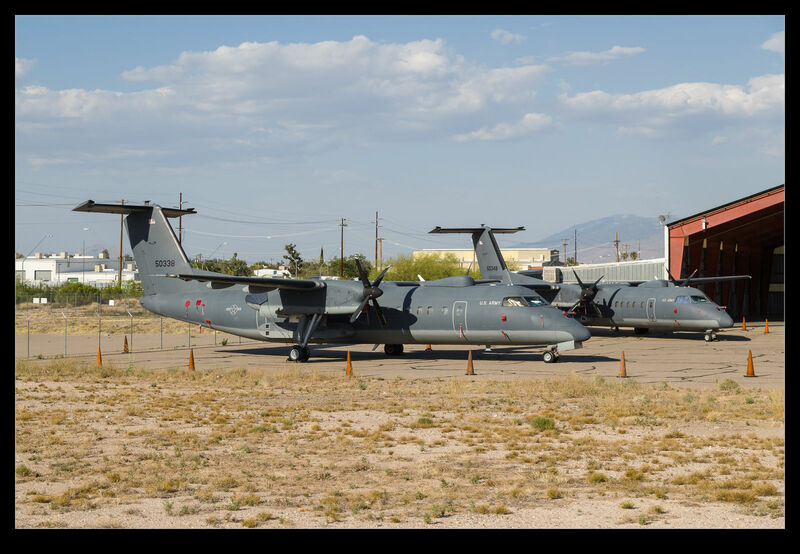 This entry was posted in aircraft, military, photo and tagged aircraft, airplane, arizona, bombardier, dash 8, dehavilland Canada, dhc-8, military, photo, ro-6a, Tucson international airport, turboprop, US Army. Bookmark the permalink. The Q400 is a stretched version of this airframe with new engines. My friend Steve was on the flight test team in Canada quite a while back now. He was on a team that brought one across the Atlantic for Farnborough. Long trip for that type of plane! Glad you like them.